Did you know that Philadelphia’s Chinatown has the greatest amount of paved-over surface area in the city? I didn’t. 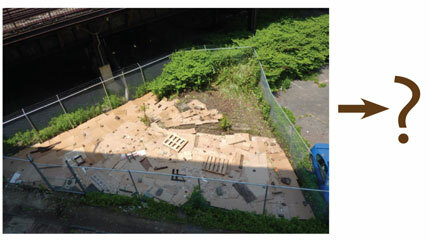 In 2008, when youth in AAU’s Community Action Class surveyed the area around their school in Chinatown North, they found neglected vacant lots, illegal dumping, and little green space. After succeeding in getting a lot next to the school cleaned up, permission to use the lot, and the fence fixed by the absentee land owner, AAU youth (with the indispensable help of adults) are now working to transform this vacant lot into a garden. Every year, children and youth in our AAU Summer Program help build the garden – little by little, inch by inch. Last summer they built raised beds, planted butterfly habitat, made bird feeders, and grew and cooked with herbs. I’ve recently been listening to some lectures on environmental psychology, and the research on greening is pretty interesting. One study found that hospital patients who had a view of something green (such as a tree) healed more quickly than those whose windows just looked out onto other buildings. Through AAU’s Summer Program and our Inch by Inch Garden, we teach children that making positive change takes persistence and hard work. But, together, we can make a difference in the world. You can make a donation to support AAU’s garden work. Listen to AAU member Dao Tran talk about her experience of being taken seriously as a 12-year-old activist back in 1987.